Hiking the LOST and feeling Superior. The Legends of Superior Trails Inc. (LOST) will be hosting a series of fundraiser events called Hashbrowns, History and Hiking. The fee is $20 and includes a hearty breakfast, a presentation on local history and a guided hike. The events will be held on the Second Friday of each month. The doors will open at 7:30 a.m. at the Superior Chamber of Commerce, which is located at 165 Main St. in Superior. Each event will conclude about 11 a.m. when the hike returns. Attendees are encouraged to stay and visit local merchants during their Second Friday events. The first event is scheduled for Friday, Feb. 8, 2019 and the topic is the Geological History of Superior. 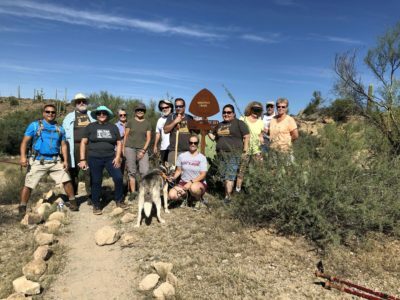 This hike will be led by Dr. Steve Semken who is a geology professor at Arizona State University. Following his talk, Dr. Semken will lead a hike on the the Queen Creek Canyon segment of the LOST trail. The second event is scheduled for Friday, March 8, 2019 and the topic is the History of Pinal City, which will be led by Scott Wood, who is a retired Tonto National Forest Archeologist. Following the breakfast and discussion, Wood will lead a hike through the ruins of Pinal City on the LOST Trail. The third and final event in the series is scheduled for Friday, April 12, 2018 and the topic for the event will be the History of US 60 and the Apache Trail. Rick Powers a local historian and retired staff from the Arizona Department of Transportation will be conducting this talk. Following the talk there will be a guided hike on the Queen Creek Canyon segment of the LOST. Preregistraton for these events is important to ensure enough food is ordered and seating is arranged. You can register for each event by visiting the Legends of Superior Trails Inc. website at http://www.lostinsuperioraz.com. You may also call Mila at (520) 827-0676 or Jim at (661) 645-1864.